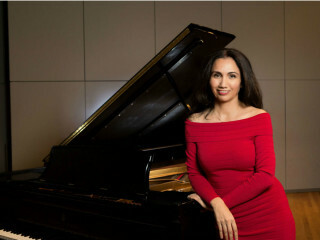 Tarana Taylor offers a recital of works including Schumann's Piano Sonata No. 2 in G minor, Op.22; Gara Garayev’s Piano transcription of symphonic sketches "Don Quixote" and more. Taylor is a diverse pianist highly experienced in solo, vocal, instrumental, chamber, orchestral, theatre and ballet music. Having worked with many notable ballet companies throughout the USA including serving as Master of Music and staff pianist for Houston Ballet, she has a thorough knowledge of both classical and folk music of different countries.